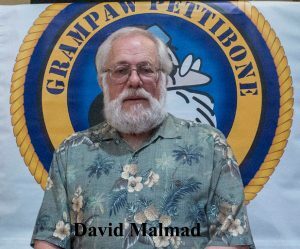 On Jan 11, 2018, David Malmad, the Squadron Public Affairs Officer was the speaker at the Grampaw Pettibone Squadron. 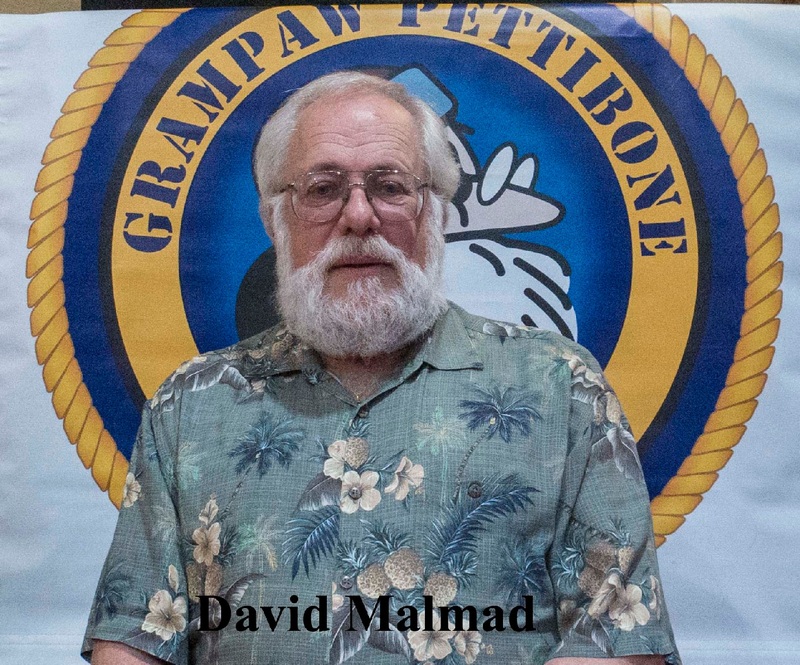 David provided the audience with an overview of the history of US Navy UAV development between 1911-1945. David opened his remarks by referencing current news reports and articles which referred to the existence and operation of aviation vehicles with such labels as; UAV, RPV, UAS, RC and Drones. He posed that the existence of such objects had a history that dated back far more than most realized, almost 170 years. The reference to the 170 year history began when the Austrian military attempted to secure the surrender of the city and subdue resistance in the Austrian province of Venice. From 12 July to 22 August 1849, unmanned balloons armed with explosives were launched from an Austrian Navy vessel. Wind conditions resulted in the balloon moving past the city before detonation occurred. Subsequent attempts using a copper cable to transmit an electrical charge to the balloon were equally unsuccessful. In 1863, Charles Perley registered a patent for an unmanned aerial bomber to aid the Union forces during the US Civil War. The design was a balloon where the basket opened with a timer to automatically release an explosive charge overatarget. No records exist to indicate either a test or use under combat conditions occurred. Inventors and their discoveries during the late 19th century contributed to the future of unmanned flight. The study of radio waves and creation of remote control devices by men like Nicola Tesla and Elmer Sperry’s research into the gyrocompass and gyrostabilizer both in 1896 were samples of such achievements and subsequent contributions for unmanned flight. Introduction of unmanned, automated and stable flight controls began to appear less than 9 years after the Wright Brothers first powered flight in 1903. Between 1911 – 1918, inventor Elmer Sperry conducted a series of tests initially with a production aircraft, the Curtiss N–9 seaplane. 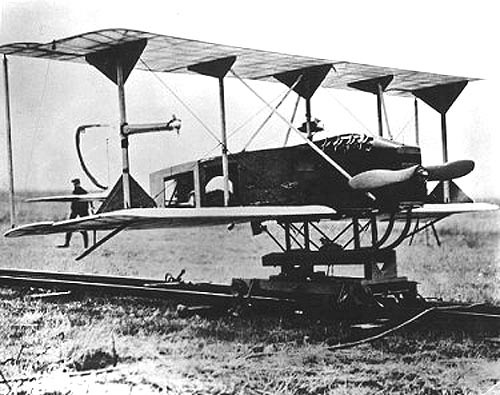 Sperry successfully demonstrated over 50 flights Aug-Oct 1913. In 1915, his son Lawrence Sperry joined the team and contributed his engineering knowledge. The addition of Dr. Peter Hewitt, who followed the design work of Nikola Tesla regarding radio remote control and Carl Norden, future developer of the Norden bombsight, provided support for enhancement of the gyrostabilizer. Initial tests of automated piloting and radio remote control were partially successful and the US Navy approved equipping six N-9 test aircraft in 1917 at a cost of $200,000. The first test occurred Sept 1917 and by November, a flight with a safety pilot onboard flew 30 miles, dropped a sand bomb within 2 miles of the target and returned. War footing commitments limited production aircraft usage and the new non-production test aircraft called the Sperry-Hewitt Automatic Airplane was only partially successful. Launch reliability and flight controls were not consistent for naval efforts and with the war ending in 1918, further testing was limited due to costs and resources. At the same time testing was conducted for the Navy, Charles Kettering in 1918 was researching and built a less expensive test aircraft for the Army. Members of the project included, Lawrence Sperry and Jimmy Doolittle. The plane was to be equipped with a 40hp engine, a 15 foot wingspan and 50 mph speed, utilizing the Sperry gyro system. Initial tests experienced problems with the engine and remote control features. With the ending of the war, further research and development was reduced and eventually ended. The early 1920s saw technology advances and by the mid- 20s a successful development of a remote control aircraft was achieved when a US Naval Aircraft F5-L seaplane in September 1924 took off, flew to a target location some ten miles distance, returned and landed. Unfortunately upon landing the plane experienced a puncture in the pontoons and sank. Subsequent tests were not as successful and the project was suspended. At the same time the ‘NT’ was being developed two Stearman- Hammond aircraft JH-1, were used for radio controlled development trials. After considerable testing and refinement of equipment with the JH-1 and Curtiss N2C-2 planes, a successful unmanned radio-controlled flight was made on 23 December 1937. Takeoff and landing was controlled via a land-based radio set; for flight maneuvers, control was shifted to an airborne chase plane. The success of this flight resulted in the aircraft being used as remote control naval aerial targets beginning in August 1938 against the USS Ranger(CV4), and a second test against the USS Utah (AG-16). During the test against the Ranger radio communication was lost with the drone and it crashed. 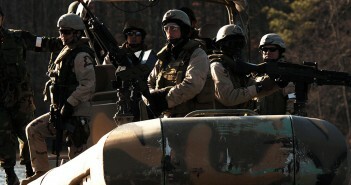 The Ranger drone test were considered a success and also revealed the need for additional gunnery training. By 1939 the use of drones as aerial targets was greatly increased and eventually became routine. The inadequacy of our antiaircraft defense against a maneuvered target was revealed and resulted in accelerating the improvement of our fire-control equipment. Target drone successes sparked revival of the aerial torpedo concept. The introduction of television in 1937 and the sharing of the technology between RCA and the US Navy resulted in the testing of a television camera in a drone in 1941. By 1942 a drone demonstration delivered a torpedo on a destroyer at a range of 20 miles from the control plane. The Naval Aircraft Factory was directed to begin development and testing of a television camera equipped drone beginning in the spring of 1942. The aircraft that was developed called TDN-1, which stood for ‘T’orpedo, ‘D’rone and ‘N’aval Aircraft Factory. It was equipped with two 220hp Lycoming engines, 48 foot wing span with a cruise speed of 145 mph and capable of carrying one 2,000 pound torpedo. The materials were non-strategic and the sub-contractor of one order not typically involved with the aircraft industry was the Brunswick-Balke-Collander, a bowling ball manufacturer. Test results were successful and did meet operational requirements. The aircraft may also be credited a first US Naval achievement, in August 1943, remotely launched from a US aircraft carrier(USS Sable). The aircraft was considered too complicated to operate and exceeded operational budget limits. It was destined to continue in a support, testing and training role. The aircraft replacing the TDN-1 was identified as the TDR-1 and would be manufactured by the Interstate Aircraft and Engineering Company. In keeping with non- strategic materials and manufacturing support, the airframe was built by the Schwinn Bicycle Company and aircraft parts came from the Wurlitzer Musical Instrument Company. The aircraft would be powered by two non-military 230 hp Lycoming engines. 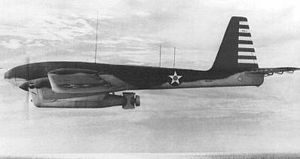 The first test flight of the TDR-1 did not occur until late 1943. As development of the TDR-1, a Grumman TBF Avenger as a control plane was added. The drone pilot operated a remote control system in the rear seat which contained a 5” TV screen remotely viewing a TV camera in the nose of the drone and a telephone dial instrument. The telephone dial would control the movement of the TDR-1 drone unit by selected dial numbers transmitting a radio signal to control altitude, direction and bomb/torpedo release. The control pilot TV monitor would be connected by radio signal to the TV enclosed in the nose of the drone to identify route of flight and target objective. On 18 March 1944, organization for deploying the TDR-1s to their operational location was turned over to the Special Air Task Force(SATFOR). In mid-April 1944, Special Task Air Group 1 (STAG-1) was staged for deployment under the SATFOR and sent to the island of Banika in the Russell Island chain of the South Pacific. On 30 July 1944—called “D-day” in STAG One’s official war diary—four TDR-1s flew a demonstration mission against a derelict Japanese freighter (Yamazuki Maru) beached near Cape Esperance on Guadalcanal. Three of them slammed into the target; two detonated as planned. Film of the assault was shown to Navy brass in Pearl Harbor, who granted permission to mount combat operations. On 27 September 1944, four drones, each armed with a 2,000- pound bomb, flew 55 miles to Bougainville to attack an anti- aircraft battery the Japanese had established on a beached merchant vessel. One of the TDR-1s was lost at sea. A second crashed 30 yards astern of the gun emplacement, but the bomb failed to detonate. The third probably hit the port side of the ship. The fourth flew through flak to land dead-center on target and exploded. Senior Naval leadership determined the armed drone program was not practical and moved to cancel the operation. Unit leadership was able to obtain a 30 day extension and in that time flew 46 aircraft where 37 reached their targets and 21 were successful. STAG One attacked gun installations, bridges, caves, a cargo ship, and a lighthouse. The standard technique was to fly the TDR-1 directly into the target, but on occasion the drone dropped bombs remotely. Though the unit was dissolved and personnel reassigned, the concept of remotely controlled aircraft as a military option was proven, in spite of the lack of support.